Mopeds are the way to get around on Nusa Lembongan. With three tin lids all below driving age this becomes a tricky task. Mrs botf and I rented 2 mopeds and your correspondent took on board Miss botf and one of the Master botfs. Being Indo I was still carrying two less kids than most family mopeds that we passed. You can pretty much circumnavigate Lembongan and its tiny neighbour, Ceningan, in a day including stops for swims, lunch and assorted photo calls, bintangs and kids issues. Highly recommended. I chose a local Lembongan dish for today’s post. Duck Lembongan. 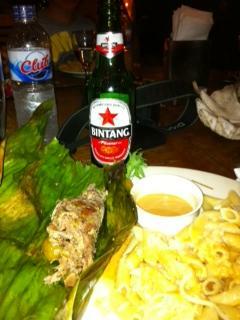 Methinks Lembongan’s culinary history is a short one as this dish matches shredded roasted duck with penne pasta. Still it was delicious in its own way. Just a note on Indo ducks. Also relevant for its chickens. These ain’t no fatted, juicy birds that have been hand raised and then slaughtered and hung on a hook in the window of BBQ King to tempt you with their dripping fats. This duck in the photo was likely the one I nearly ran over on my moped this afternoon as it scratched about for scraps in the gutter. They are scrawny and a bit stringy. Still tastes like duck.